Star Drive Screws - The Ultimate Screws - Star Drive Wood Screws - Screw Products, Inc.Star Drive Wood Screws – Screw Products, Inc.
Why Use Star Drive Screws from Screw Products, Inc.? Screw Products, Inc Star Drive Screws the ultimate wood screws are milled with an extra deep recess, this provides the screws with twice the torque over Phillips or square drive screws! The benefits include, longer bit life, reduced camout, reduced end load, and virtually eliminates stripping and fastener damage. Products are made of heat treated hardened steel. These screws will virtually drive themselves! Reduced Camout & End Load Bit life is increased. Proper drive size eliminates spinning and damage to the fastener. Star Drive recess handles twice the torque over Phillips or Square Drive. Twist off is virtually eliminated. Screws can be removed and reused. crumbling or crushing, reducing splitting and cracking. Knurl on shank reduces drag, makes driving easier, especially in hardwoods, reduces chipping and chaffing. 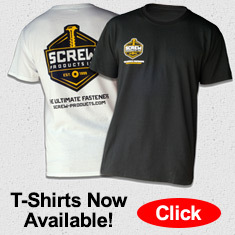 NEWS: Screw Products, Inc. Logo T-Shirts Now Available! News: New Self-Drilling Drywall Screws!